I normally include only a small proportion of local planning applications in this blog, normally new build properties, but this application – although only concerning a fence – is a ‘retrospective’ one. This means the work was done and the planning application submitted afterwards, and you may have your own opinions about that. UPDATE: The fence is to be moved and hidden. See note at end. Where is the planning application for? What do they want to do What have they done? Remove a mature hedge border between the property and the road, replacing it with a wooden fence. Accommodation owned by Emmanuel College. Where is there more information available? • Click here to read the application. • Click here to read any public comments already made. When is the last date to comment to the council? • Click here to add your own comment online. Note: you will need to log in or register first. • Click here to email your comments to the case officer, Nathan Makwana. You must quote reference 16/2028/FUL. As well as commenting to the council, you may also wish to comment below, for other local residents to read. Following representations from residents, the college is to move the fence back and screen it with new planting. See the document “DELEGATED REPORT” on this page. So, Emmanuel College have ripped out a beautiful mature yew hedge on Hills Rd behind the red post box in front of their medical hostel, no 285- 287 Hills Road. They have replaced the hedge with a massive 50m frontage of ugly fencing. Looking at the evidence of where the yew hedge was, it seems the fence was constructed beyond the boundary line, i.e. nearer the highway. Advised of this long before they finished the works, the College moved a section of the fence a bit further back. But they pressed on regardless. The City Council’s Planning Enforcement officer raised an enforcement case. 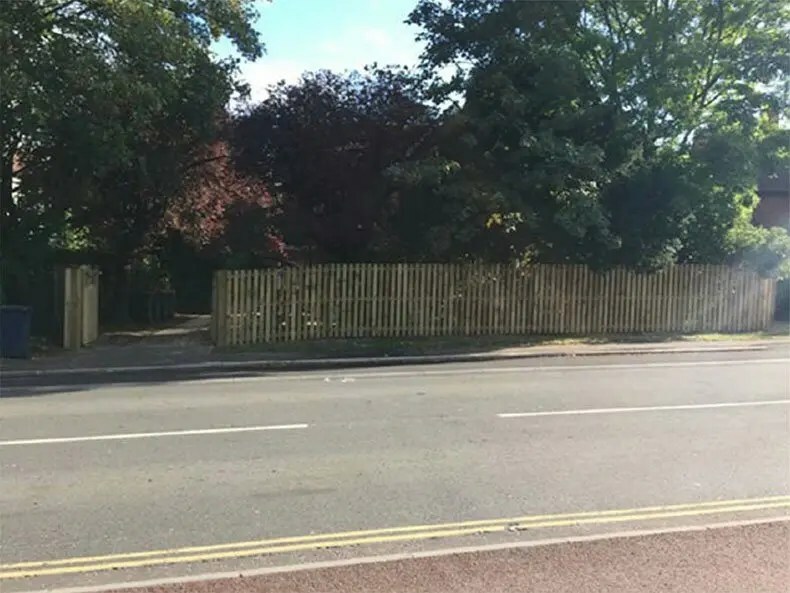 Emmanuel then applied for retrospective planning permission, plastering their application with photos of other fencing on Hills Road and citing ‘bike security’ as a reason for ripping out the hedge and installing their ugly fence. But there would have been ample space for the College to have put their bike store elsewhere, or even to have fenced it off. No doubt the College has plans for those other green spaces. There is a big garden there too. Is there to be one rule for the University and Colleges and one for residents? People all over the city are asking. Why didn’t Emmanuel respect the planning process? The trees and shrubs of Hills Road are listed in the City Council’s Hills Road Suburbs and Approaches Heritage Report as an attractive feature of Hills Road. This heritage report is cited by the Local Plan, so this is a planning consideration. The report refers to ‘the softly landscaped boundaries of the majority of the houses’ and ‘the bosky (that means wooded) character of the road’. 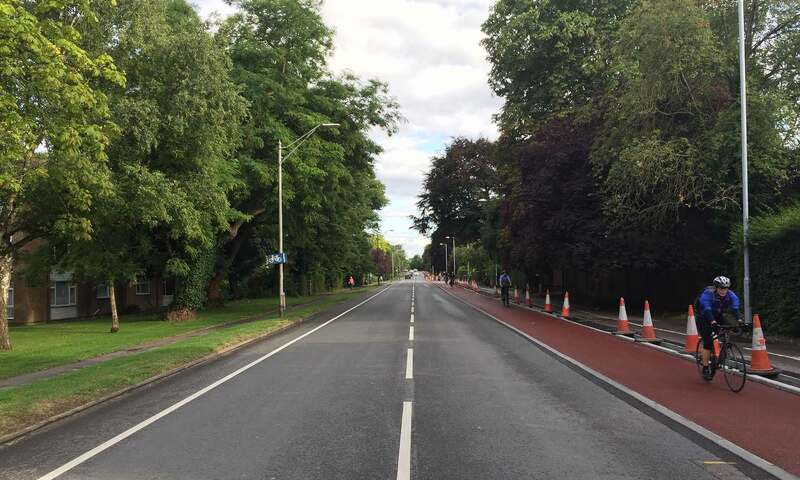 It makes the point that the green infrastructure of Hills Road, particularly its trees and hedges, are a valuable city amenity, enjoyed not just by Hills Rd and Queen Edith’s residents, but by the many users of this busy main road. Most trees on this road, including the ones on this property, have TPOs. Neighbours received no notification from the College. They have commented on the College’s lack of neighbourliness – or unfriendliness. Trees and greenery are an important buffer against pollution. 285-287 Hills Rd is a hostel for medical students. Cambridge’s poor air quality poses serious health problems particularly for those living on (or near) busy roads which suffer from congestion. Emmanuel’s Senior Tutor, Robert Henderson, is Reader in Macromolecular Pharmacology at the University of Cambridge. Is this the right action for a medical hostel (with a Senior Tutor who is a high level medic!) to have taken on a very congested road? Is it worthy of a College whose Master is Dame Fiona Reynolds, campaigner and former Director of the National Trust? Dame Fiona has just published a book, The Fight for Beauty. This makes the case for beauty and design and the importance of using beauty in the planning process to shape development. Sadly, this is not the only way in which Emmanuel College doesn’t come across as community minded. The College is challenging the Cambridge Local Plan in order to be able to build on College playing fields, citing insufficient use. This, from an educational charity, in a city where schoolchildren are suffering from obesity. These YouTube clips are quite revealing. There are others doing the same! Nathan Makwena (nathan.makwana@cambridge.gov.uk) is the planning officer responsible for the case at Cambridge City Council. He says that although the closing date for you to omment is 23rd December: “I’ll be happy to accept further comments up until the 30/12/16. This allows for an additional 7 days”. He adds: “In terms of what is considered a ‘material consideration’, here is a link to the planning portal website outlining some material considerations that are taken into account when assessing a planning application”. Whatever Emmanuel say, the destruction of the mature yew hedge is a real loss of amenity. It is an abuse of the planning process designed to protect neighbourhood and community. The contractor advised that Emmanuel’s fence cost about £1,500; what is this, set against loss of quality of life, clean air, bio-diversity? At the very least Emmanuel should put up a sustainable green hedge (not Leylandii) – and a mature one and engage with residents about this. Chair, Hills Rd Area Residents Assoc. At least they were stuffed on the cost of the fence. There was no Yew hedge on the front boundary at 285 – 287. Your photo does not show a mature yew hedge. The hedge was Lonicera. Nobody, but nobody should ever consider building on playing fields. Ever. I wonder if the planning committee (or officers, whoever decides) would be bold enough to refuse permission and ask that they replace the yew hedge? Admittedly it would not be the mature hedge that was there but a point would be made. The fencing looks dreadful and totally out of place in a largely mixed hedge frontages in Hills Road. The gates and posts are at 285-287 of high quality and the fence is of open design to enable the college to plant saplings to grow up through the fence – it has confirmed by email that it will do this to restore greenery and soften the look. If we do not like it then we should indicate what we would wish to have been done since the ‘greenery’ towards that end of Hills Road is aged and largely unkempt, as indicated by the hacking that has been required presumably to prepare for the cycle path. Similarly the narrow combined path/cycle path around into Long Road is overgrown and so awkward and potentially hazardous to users. It could do with being cut back. Would we welcome such adverse comment as a private householder? I removed a Leylandii hedge from the front of my house which I inherited and replaced with a fence with shrubbery in front. Pretty much like Emmanuel. I appreciate that (most) commenters use their full names since this maintains the integrity of the process. Appreciate what you are saying Martin, but the point is the College ripped out a mature yew hedge – an attractive & “sustainable” hedge, a buffer against pollution on what is a busy main road – ie not a leylandii hedge. Think how long it takes to grow a mature yew hedge. Why didn’t they install the new fence behind the hedge? There was room. 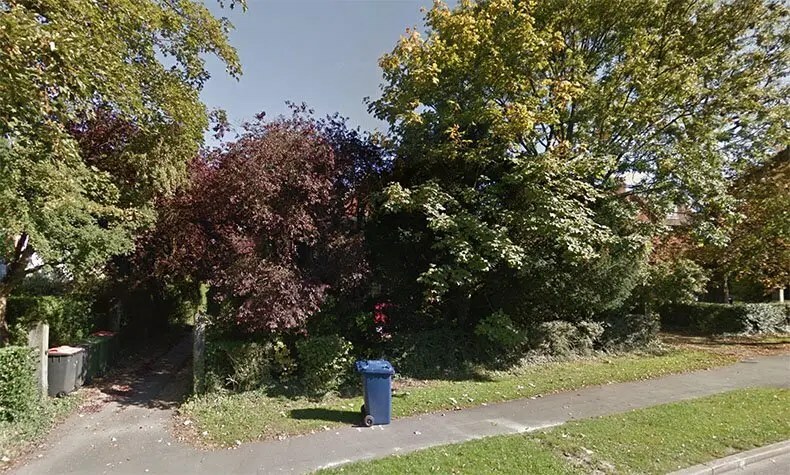 They did not engage with any of the neighbours – ignored the planning process – not just about getting planning permission to replace the hedge with a new fence on the highway but also but observing height restrictions. This is a high fence – 1.8 m, as recognised by the City Council’s Planning Enforcement Officer. Hence peoples’ comments – the planning system is about protecting local amenity – regardless of whether that is threatened by institutional or private householders. The contractors, when they were building the bike store were asked how this might impact on the yew hedge. They informed people the hedge would not be affected. My comments on the fence were posted some time ago. If Emmanuel have serious plans for landscaping the fence that is really great – because setting aside ‘the quality gates’ – there is now 50 m frontage of ugly, 1.8 m fence for them to cover up. Beautify is in the eye of the beholder. Personally I think the open nature of the fence looks better and the many others that have been erected without permission down Hills Road. They are completely closed off and look more solid with no attempt to plant hedging in front. The residences do seem to be victimising the College rather than reporting all the private properties that have erected fences. It does seem very two faced. Most hedging along Hills Road is completely over grown and looks scruffy. If people don’t like the view while riding down the road, and it offends people that much, may I suggest an alternative route! The hedge was not Yew, it was a small-leaved honeysuckle hedge, Lonicera microphylla.